Depawater offers a range of sewage treatment plants parts and accessories to work with the Tricel Vento septic tank, Tricel Novo and Tricel Vitae wastewater treatment plants as well as Tricel Puraflo. From servicing to parts we have all you need to keep your Tricel septic tank or sewage treatment plant in perfect working order, also ensuring the smooth running of the system and the correct level of operational efficiency is maintained. From covers to compressors, distribution boxes to risers, Depawater have everything in stock to suit the Tricel range of septic tanks and sewage treatment plants. 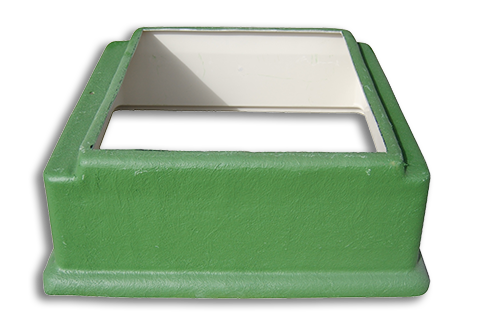 Part of the sewage treatment plants parts range, Depawater offer distribution boxes to help distribute effluent evenly into drainage fields (soakaways). A Tricel Sampling and Distribution box is a gravity fed sub-surface irrigation solution which provides for the distribution of pre-treated sewage effluent from single domestic dwellings connected to a septic tank or sewage treatment plant and distributes to an underground drainage system. The system operates by discharging fluid effluent through percolation pipes to an underground disposal area via infiltration trenches (soakaway). Risers are available for deeper excavations. When sewer pipes may be located at deeper burial depths risers can be fitted to Tricel septic tanks or sewage treatment plants to provide accessibility for desludging and maintenance of the system once installed at these deeper burial depths. Easy to fit, Tricel risers transform the unit making it uniquely adaptable to all site conditions and deeper excavations. Risers for Tricel Vento septic tanks are necessary on both inlet and outlet side of the Vento. Each riser is 180mm high and can be used to a maximum height of three risers. Risers for Tricel Novo wastewater plants. 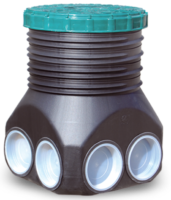 Three different manhole riser heights to suit different invert/inlet levels are available. Depawater and Tricel offer a choice of manhole risers at 250mm, 500mm, 750mm to help with installation where site conditions require a flexible solution. Risers are also available for Tricel Vitae wastewater treatment plants. Again this unique product is adaptable to all site conditions and requirements, giving you the flexibility to adapt to challenging site requirements through deeper burial depths and excavations. With 1000’s of Tricel products supplied to our growing number of satisfied customers across Northern Ireland and beyond, with 10 years of industry expertise, Depawater have faced some of the most difficult challenges with septic tank and sewage treatment solutions. We have solved them every time using Tricel. Tricel is the No.1 choice when it comes to off mains sewage solutions, for superior reliability, remarkable efficiency, unbeatable value for money, and all delivered to you through a partner you can trust, that’s why all our customers choose Tricel. With a dedicated backup service provided by our trained British water accredited service engineers, you know we will provide you with a professional service that you can depend on at all times. Our friendly and helpful staff do all we can to help and assist, delivering you a professional service that you can rely upon at any time, that’s why Tricel customers in Northern Ireland choose Depawater, as their expert septic tank and sewage treatment system provider.